Are you getting infected by Cold and cough daily? 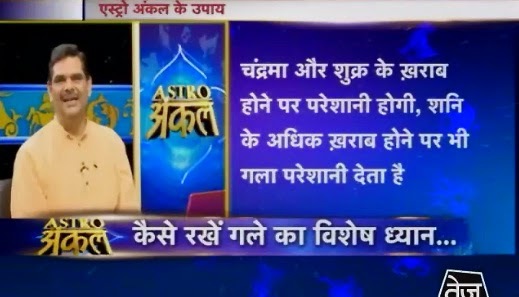 Here is astrology remedy for cold and cough infection by astro uncle episode 9th August, 2013. Due to weak Moon and Venus you have problem. Weak Saturn also creates throat problem. Throat infection also occurs due to bile and cough. You have to control it. You should avoid cold and sour food. You can drink lukewarm water after lunch/dinner. You have to do gargle with lukewarm water in morning-evening. You will get more benefit by doing gargle with water adding turmeric or tea. You can drink hot milk adding turmeric. You can mix sesame oil and turmeric and keep on your throat in night. Make bundle of turmeric and keep it on throat at night. Take lukewarm sesame oil and add turmeric in it. You can keep it on your chest. The infection will remove. You can do gargle with iodized water. Do not eat too much ghee. If you have cough problem then you should avoid taking milk. You can take Kaccha Suhaga and Kachur. You have to take medical advice. Remedy: You will get benefit by drinking lukewarm water adding lemon and iodine if you get more sleep.